Stage Tec presents — AVATUS — a new mixing console concept! The pioneers at Stage Tec now present AVATUS, the new mixing console concept combining ground breaking technology and a contemporary look and feel. It is a fully IP-based large mixing console with 21" multi-touch displays. AVATUS control elements and interfaces are connected through standard Ethernet. The console control surface and other elements communicate via IP networks, enabling remote production. The interface offers flexibility, which enables customised function assignments. 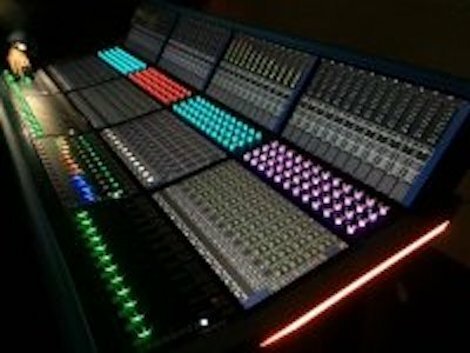 Stage Tec has also equipped the AVATUS mixing console concept with workflow oriented controls. For example, the touch displays provide context related functions. The colour coding of functional units allows for rapid and intuitive operation. Device view function also ensures efficient workflow; instead of switching each crosspoint separately, device lists are now utilised. AVATUS mixing console concept configurations are context-dependent and can be set on all displays. The control surface will initially consist of just three panel types. There are no central panels, which enables multiple users to operate a console from different locations. The AVATUS mixing console concept supports multi-touch displays, which provide access to all parameters and central functions. The mixing console interface can be split, since the displays can be relocated as required. The AVATUS mixing console concept provides more than 800 input channels and 128 sum buses. Channel formats range from mono to 7.1. Features such as the de-esser, implemented as an audio module, loudness metering, multiband compressor, and the Stage Tec automixer are all integrated. Control surface sizes range between 12 and 96 channel strips. Inter-connectivity with other systems will be further enhanced by implementing the AES70 standard. Contact us at Stagetec Mediagroup Australia to find out more on the benefits of these developments plus how we offer cutting edge technology combined with quality products and services.